Curved Air will be celebrating their 40th anniversary as a band in 2009. This is a group that have outlasted many a marriage. Labeled Prog Rock by some, Art Rock by others, Curved Air are what they are. They need no label, they are masters of their own genre. The combination of Darryl Way on electric violin and the haunting vocals of Sonja Kristina were an instant hit. I can think of few bands from this period that had ‘cross over’ appeal, but Curved Air did. They satisfied the often finicky prog crowd and still had mass market success. The single Back Street Luv being a great example, it charted at #4 in Britain. The band has gone through extended periods of dormancy as the major players pursued solo careers, however they have once more come together to release a CD that features both old and new creations. When I heard about Reborn, it became a major item on my To Do list! I am sure the mail man thinks I am crazy, I literally snatched the package off him and tore into it saying, â€œIt’s Curved Airâ€ and dashed into the house to put it on my player. I was not disappointed, Reborn is a fabulous celebration of this wonderful group. Missing from the original band is Francis Monkman on keyboards however Darryl Way picks up that gap seamlessly. Maybe the most surprising aspect of Reborn is Sonja Kristina’s voice, she still has that haunting lilt that was so endearing in the early 70’s, her voice has not changed in more than 30 years. OK, I hear you all asking ‘so whats on the CD?’ The simple answer to that question is that if you are a Curved Air fan everything great from their formative period 1970 â€“ 1973, plus a couple of new tracks. Back Street Luv and It Happened Today are masterfully crafted, recapturing the vibrancy of the originals, I know that because I have the vinyl to prove it! On the new side of life there is The Fury, written by Darryl Way that showcases his amazing abilities on the electric violin. There is also a very interesting dance remix version of Back Street Luv, I am not usually a fan of the dance genre, but this one is well worth a listen. In support of Reborn Curved air have been touring in England, and are shortly headed to Italy and Japan. I can only hope that at some point they decide to come stateside and do some concerts. This is an absolute must have CD for any Curved Air fan. Great stuff, it is so good to see this classic band performing again. You can get your copy (because you are not getting mine, you would have to pry it from my dead, cold, and stiff fingers) from their Web Site. 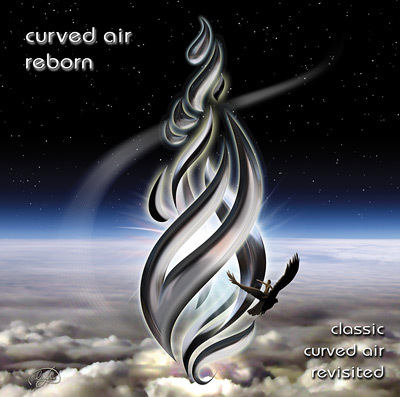 2 users commented in " CD Review: Reborn by Curved Air "
Great review. I am a long term Curved Air fan, have all their albums and have seen them countless times. I thought this CD well worth the price as it shows the old songs how they should’ve sounded given today’s superior recording technology. Two great new songs too.